Orgelmakerij Steendam is located in Roodeschool in the province of Groningen, in the most northerly city in the Netherlands. Since 1986, Orgelmakerij Steendam has built, rebuilt, restored and renovated organs ranging from chest organs to three manual organs with independent pedal. 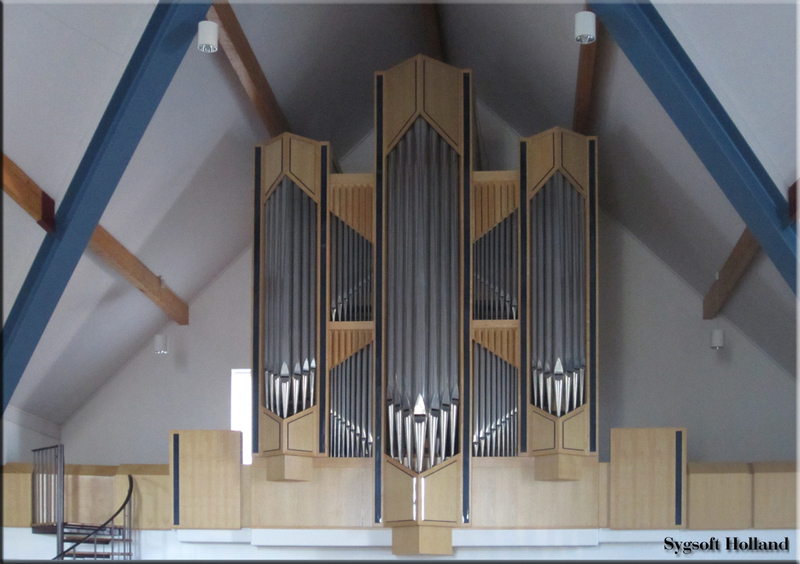 The organs of the 19th century organ builder, C. G. F. Witte, his predecessor, Batz, and the organ builder Christiaan Muller stand centrally as inspiration for the organs of Orgelmakerij Steendam. This means that all work is performed using historical methods, with an eye to technical and musical details as already used for centuries of organ building. In addition to organ building, Orgelmakerij Steendam also busies itself with the appraisal of organs, the construction of church furnishings (mostly in the context of organs) and, for two weeks per school year, Sicco Steendam is guest lecturer (organ building) at the Music Academy in Moscow. In the shop in Roodeschool organs up to 16 feet in any dimension are built. All drafting is carried out in their own shop, and this makes possible close consultation with the client and the fulfillment of almost every wish. Throughout, sight is never lost of the function that the organ is going to serve and the final result is attuned as much as possible to the building in which the organ is placed. For Sicco Steendam the love of organs is number one. Contributing to the preservation and expansion of the rich organ treasure in the Netherlands and surrounding countries is a major motivator for this organ builder. De Eben-Haëzerkerk is one of the largest churches in Apeldoorn. The church building was opened on the sixth of October, 1995, and was built as instructed by a neighbourhood congregation established in 1979 and associated with the PKN. As such it is aligned with the Gereformeerde Bond. The building was conceived by Valk architects in Soest. In addition to the large auditorium with room for 750 to 800 persons, the building has a variety of halls where church meetings take place and where associations meet. On February 21, 1997, the Steendam Organ was inaugurated by Marcel van de Ketterij and Peter Eilander in a service for parishioners and other interested parties. At the time it was an instrument with 19 ranks and a fair number of prepared for ranks. In the mean time, 4 ranks have been added, namely the Open fluit 4' and the Sesquialter II to the Hoofdwerk and the Salicet 4' and the Dulciaan 8' to the Zwelwerk. As requested by the congregation it became a romantic instrument well suited to supporting congregational singing. A large part of the organ literature may also may be interpreted faithfully, in particular, romantic works, and not in the least because of the very effective swell. The organ case, as well as other church furnishings, are made of ash. Because the organ builder and the architect of the church were able to collaborate at an early stage, the organ is one with the building. The facade is dominated by a stately central tower displaying the largest pipes of the Hoofdwerk. The upper pipe fields also indicate that the organ possesses a Bovenwerk. In Apeldoorn the situation is such that the pipe work of the Bovenwerk is placed in a swell box which may be operated by hand or by foot. Permanent organists at the Eben-Haezer kerk are: Peter Eilander, Marcel van de Ketterij and Arie Kortleven. Tuning: a' = ca. 440 Hz. The tremulant works on the Zwelwerk. On the Zwelwerk, we recorded the tremulant as an integral part. Please note that nr. 10-Schalmey 8' is not available on the actual organ. No tremulant was recorded since the effect is barely noticeable. From keys 60 - 91. From keys 48 - 91. Integraal. From keys 60 - 91. The organ has a swell pedal which operates on the Zwelwerk. This sample set was recorded from different 3 positions in stereo (24 bit 96kHz). The set comes with a 3 channel technique developed by Sygsoft which makes it possible for the listener to alter his listening position. 1: Front, recorded very close to the organ. Here you will hear a very direct recording well suited for studio purposes. 2: Middle, this recording was made from a distance approximately 3 x as far as the front recording. 3: Rear, far away from the organ, and useful for surround sound. Combination I: Octaaf 8'; Roerfluit 8'; Open Fluit 4' and Cornet. This switches in automatically (only with tremulant) if these voices are selected. Should you not wish this automatic switching to go into effect, go the the menu item"Couplers" and select in the column "Hoofdwerk" the button marked "Auto combination." The LEDs under the drawknobs indicate whether the combinations are in effect. By means of the buttons marked by a red arrow (See figure 2) you may select these combinations. Here also, the LEDs under the drawknobs indicate which combination is chosen. Combination V: Reset the last chosen combination. Nasard 3'; Roerfluit 4' and Holpijp 8'. Gemshoorn 2'; Nasard 3'; Roerfluit 4' and Holpijp 8'. Dulciaan 8'; Roerfluit 4' and Holpijp 8'. Roerfluit 4'; Holpijp 8' and Gamba 8'. Roerfluit 4'; Holpijp 8'; Gamba 8' and Prestant 8'. 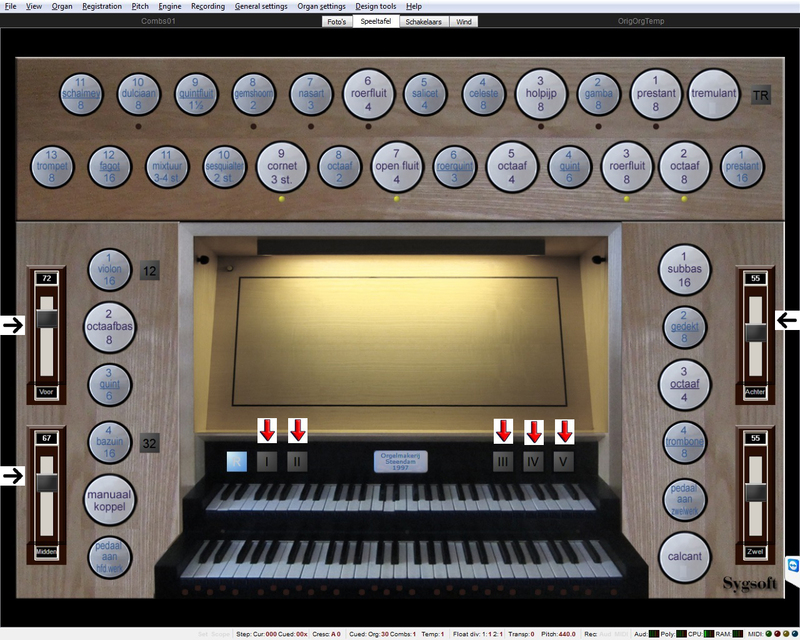 Because recording the samples with tremulant made the sample set almost twice as large, we have also supplied the organ with an old fashioned Hauptwerk tremulant. For all voices recorded with tremulant, 2 samples per key were made. Should you wish to not load the complete set, because it demands too much memory from your computer, you can begin by omitting all ranks whose names end in "Trem." After loading, click on the "TR" button near the tremulant (the button must be blue, see fig. 5) and you will hear the Hauptwerk tremulant. Remember that now you cannot use any of the recorded tremulant combinations (see heading 6B). Now, via voicing, you can adjust the tremulant according to personal taste. Remember that all adjustments must be carried out 3 times for Front, Middle and Rear. To reach the correct voicing page, right click on the relevant buttons on the page "Schakelaars". The sample set was recorded from October 8 to 13, 2012. Recording quality 96 kHz 24 bit, reduced for this set to 48 kHz 24 bit. Number of samples incorporated into this set: 29,665. Number of files in this set 30,084 in 691 folders. Number of statements in the Organ Definition file: 1,811,153. Number of km driven for consultation, testing and final recording: 900. Johan van der Waal van Dijk: processing of the samples and technical advice. Fred de Jong: Lay-out, ODF as well as publishing the website. Martijn Bouwheer for establishing and maintaining contact, photography and supplying technical specifications. Gosewin Bos as church warden was responsible for providing permission for the recording. Many hands make light work: This was a major job! Fred de Jong, March 2014.